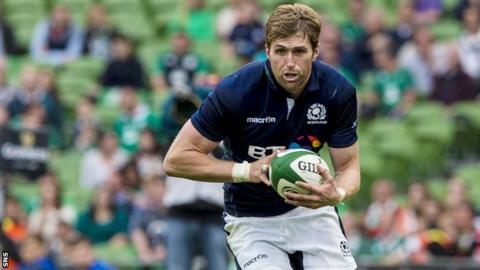 Former Scotland international Richie Vernon has announced he will retire at the end of the season. The 31-year-old won 24 caps and was the first Scot to start Tests as a forward and a back since 1878. He had two spells at Glasgow Warriors, winning the Pro12 in 2015, before joining London Scottish, but now wants to "build my new career in the city". "After 13 years of professional rugby I know the time is right to hang up the boots," said Vernon. The Dundee-born player began his career as a fleet-footed back-row known for his pace and ball skills in open play, before converting to centre in 2013. He won his final four caps in the Scottish backline, the last of which came at the 2015 Rugby World Cup - Vernon's second appearance at the global showpiece. The 6ft 5in, 102kg player also had spells with the now-defunct Border Reivers and Sale Sharks, representing Scotland Sevens in the 2014 Commonwealth Games.